Harry Straight, President; Glen Piatt, Vice President; Marie Thompson, Secretary-Treasurer; I. M. Straight, Legislation; Annie Laurie Drum, Membership; Henry Prichard, Program; Vernon Hamilton, Housing; Mary Norris, Community Affairs; Roy Miracle, Protective Services; Virginia Stahl, Education; Lester Lehman, Bicentennial; Harold Thompson, Past President. 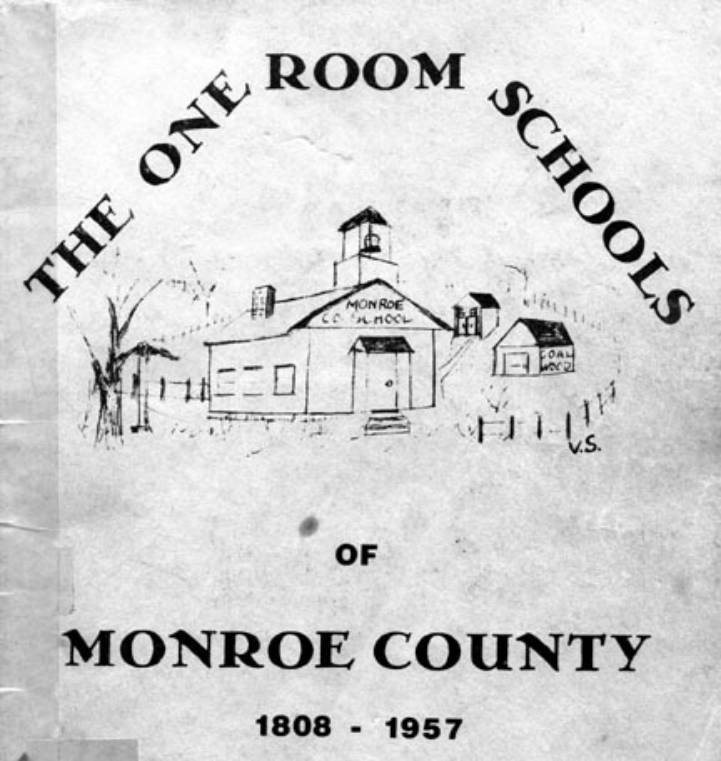 The above officers, under the chairmanship of Lester Lehman, are responsible for this booklet - "History of Monroe County One Room Schools." However, this booklet has been a project of the entire membership of this association. We want to sincerely thank anyone who has contributed material or information for the book. As President of the Monroe County Retired Teachers Association (1975-76) I want to thank all the officers and members for the excellent cooperation, fellowship, suggestions and encouragement that they have given to me for the past two years. It has been an enjoyable experience for me. "No longer sits the schoolhouse by the road", even the blackberry vines that crept nearer and nearer the subject of the poet's childhood memories no longer mark the spot where the rural school once stood. The memory of these buildings which once dotted our countryside, becomes increasingly dim with each passing generation. Many of our retired teachers recall these vividly for it was very likely they once attended one of these as a student and in the case of many, a great portion of their teaching career was spent within the walls of one or more of these structures. that supplied the men and women who would dam our rivers, build our railroads, write our books, and transform this sprawling rural countryside into the greatest industrial nation the world has ever seen. were to be found in every corner of the world determined that the freedoms we hold so dear should become the inherent right of all. Today the rural school is no more. Much as the flint lock rifle, the spinning wheel or the covered wagon, it has served its purpose and has given way to a more advanced and complicated system which is with us today. Only occasionally is one found and then likely used as a storehouse or perhaps gathering dust in a museum, or existing in the memory of an older generation of a way of life now past and gone. It is for this reason that this listing of rural and village schools which once existed in our county has been undertaken. the county here and there one may be found. The rural school has played a conspicuous part in the history of our county, our state, and our nation. We retired teachers were a part of that history. It was here that we taught. It was here that we made our contribution to another generation ot God's people. We are grateful for the opportunity we have had, and are proud of the boys and girls we have taught. It is our hope that the heritage we received has been transmitted to our successors a bit richer. Much effort has gone into the perfecting of this list and to those who have been responsible we give our sincere thanks. Our sources of information have been confined to the memory of those who once knew of the locations of these buildings and the information coming to us from Caldwell's Atlas of Monroe County. No doubt our list is incomplete. If anyone reading this has knowledge of any school not appearing on this list we would be glad to have the information to add at a later date. MELLOTT RIDGE - This school building still stands and is used as a meeting house by a small congregation of the Church of Christ. At least two buildings stood on this site which is about 2 ½ miles from Cameron on County Road 231. The school was closed in 1937 and the pupils attended Cameron School. The last teacher there was Clarence Gates. Others were: John Pfalzgraf, Marjorie Bierie Webb, and Paul Turner. WEEKLY - This school was abandoned about 1883 and 1884. It was located on Township Road 168 in Section 25. The land on which it once stood is now owned by George Visnic. This school was replaced by Center School. A small cemetery still marks the spot where this building once stood. CENTER - This building was located in section 32 on Township Road 152 near the junction of Township Roads 152 and 167. Teachers known to have taught there were: Jacob Pfalzgraf, Samuel Pfalzgraf, John Pfalzgraf, Fred Pfalzgraf, T. T. Gillispie, Guy McKelvey, and Vernon Sumption. DEMOCRACY - Democracy School stood at the junction of County Road 30 and Township Road 454 about one mile south of Altitude or about 6 miles west of Cameron and about 6 miles east of Woodsfield. The ground on which it once stood is presently owned by Dorothy Walton. It closed about 1927 and was the first attempt at consolidation in Adams Township and probably one of the first in Monroe County. James McCaslin was hired to transport the pupils to Fairfax. Teachers known to have taught there were: Guy McKelvey, Daisy Keevert Ward, and the Kiedash Sisters. FAIRFAX - This building was located on what is now State Route 78 in section 29 on soil now owned by Stanley Ault. The building was moved and fashioned into a dwelling now owned by Bob Ollom. This was one of three school buildings that stood in the immediate vicinity. This building ceased to operate as a school about 1932-33. Teachers known to have taught there were: Jacob. Samuel, John, Fred Pfalzgraf. MINOR - On County Road 29 about 3 miles west of Cameron. The ground on which it once stood is presently owned by the S. E. Pfalzgraf heirs. This was on Sunfish Creek and closed about 1880. BRACEY - This building stood at what was once known as Bracey's Mills which was near the junction of Piney Creek and Sunfish Creek. The school seems to have gone out of existence with the mill. This is believed to be about 1880. DEWEY - This one room school was located on State Route 26 on the farm presently owned by James Lindamood. At least three different buildings were built on this location which is approximately nine miles north of Woodsfield or three miles south of Ozark. It closed about 1935 or 36. It was said to generally have been taught by a member of the Gallagher Family. school who are known to have taught there were: Cephus Stevens, Forrest Gutherie and Parcel Mallett. Some of the grade teachers who have taught there were: Pearl Treiber Kimpel, Clara McCoy, Margaret Wallace Hartline, Florence Hickman, Helen Pfalzgraf, Elaine Rea, Raymond Straight, David Highman, Brady Hines, Ethel Staib Pfalzgraf. Mrs. Ivan Miracle. Charles Ward, and Herman Bough. In addition, Albert Ward, conducted two special classes there for a long period of time, possibly as much as twenty years. One class was in Spencerian writing and the other in pedagogy. This class was primarily directed at preparing teachers for the Boxwell examination, which if passed successfully would qualify them for certification as teachers. This venture had the blessing of the school examiners of the county and represents one of the earliest attempts at teacher training in Monroe County and possibly in the state as well. In 1813 the first school was taught by Henry Bower in a small log cabin in section 20. Another school was taught in 1815 in a log cabin on the land owned by Isaac M. Cline. The teacher was Wm. Knight. This location was along Muskingum Creek which was later known as Jericho Community. 1900 - 01 C. Bolen $25. per mo. In 1941 the school was discontinued and the pupils were transported to Brownsville School. 1939 School Closed and Pupils Transported To Brownsville. 26 x 30 foot structure. The contract to build was given to I. O. Swallow for $650.00 and an additional $200.00 for the annexed townhouse. It was voted that labor was not to exceed $2.00 per day for tearing down the old building. When the school was closed in 1964, the building was sold to Glen Dye who later sold it to Eugene Winland. He made the building into a garage. In 1959 the Benton Township School District became a part of the River Local District. In 1964 the Brownsville and Antioch Schools were consolidated to form the New Midway School on Route 800 south of Antioch. 1935 - 39 Glen Dye, Gr. 5-6-7-8 -- Helen McHugh Gr. 1-2-34. 1939 - 40 Glen Dye 7 & 8; Kermit Cline 4-5-6; Helen McHugh 1-2-3. 1940 - 44 Glen Dye 7 & 8; Ray Ring 4-5-6; Helen McHugh 1-2-3. 1944 - 48 Glen Dye 5-6-7-8; Helen McHugh 1-2-3-4. 1948 - 51 Mary Pryer 5-6-7-8; Helen Dye 1-2-3-4. 1951 - 64 Glen Dye 5-6-7-8; Helen Dye 1-2-3-4. 1964 Brownsville consolidated with Antioch at Midway. 1926 - 29 A two year high school at Brownsville with Inez Lash as teacher. After Brownsville School became a part of River Local School District special music teachers came to the school for the first time in Benton Township. Connie Graham was the vocal teacher and Van Morris the instrumental. Morris soon had each student in grades 5. 6. 7 & 8 playing in the cadet band (19). Glen Dye provided instruments for those students unable to buy their own. There was never an inside bathroom in any Benton Township School nor any school lunches ever served. Glen Dye taught 44 years in Benton Township. Helen (McHugh) Dye taught 34 years and 29 of these were consecutive in Brownsville. Miranda Wilson taught 18 years in Brownsville; Kermit Cline 10 years in Benton Township and Ray Ring 14 years in Benton Township. 1901 - 02 J. A. Hendershot $15. 1957 - 59 Harold Hensel until consolidated with River Local District. 1926 - 27 James McHugh, Pres. Bethel High School at Marr.